FIFA Worldcup 2014- A Celebration or a Tragedy? “World Cup for whom?” read the words painted on a wall on a street in Sao Paulo. Many in Brazil’s middle class are unhappy with the effects the World Cup has already had on their lives. The cost of living has risen in the cities hosting the games, traffic jams have worsened, and a construction boom aimed at improving urban mobility has only compounded problems, they say. But it is the poorest Brazilians who have borne the brunt of the World Cup preparations. According to the Popular Committee for the World Cup and Olympics, a group opposed to how the games’ preparations have been handled, 250,000 people across Brazil have been forcefully removed from their houses or are being threatened with eviction. Sao Paulo, Rio de Janeiro and Porto Alegre are the most affected cities, it says. This is a very important issue that needs to be addressed by Brazil’s government and FIFA. 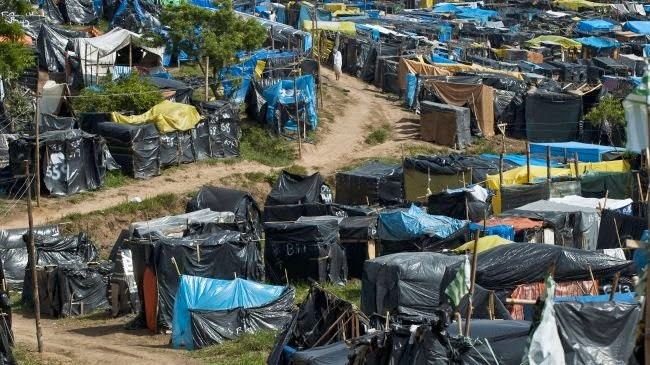 People are forced to live in tents,set up in land recently occupied by members of the Homeless Workers Movement, near the Itaquerao stadium, in Sao Paulo, Brazil, Tuesday, May 6, 2014. The residents of the new tent village two miles away from the stadium say the neighborhood’s rent went up as a result of the World Cup real-estate fever in their neighborhood, driving them from their homes.